As spring begins, people start to come out of hiding and all kinds of festivities occur to celebrate the change of weather — a good example being music events. Bamboozle was New Jersey’s way to kick off the warm weather festivities. The three-day long rain or shine music festival hosted a large array of artists from all different kinds of genres and levels of popularity. Acts with influences from rock to metal, from pop to hip-hop, from mashups to electro and indie were all in attendance at the Bamboozle festival this year. Even Drexel’s own Chiddy Bang was in attendance to put on crazy performances for all three nights. It seems like it was just yesterday when we were getting lunch at the Handschumacher or hanging out in the dorms. Once a student I saw on a regular basis at school, Chidera Anamege is now an international hip-hop star and world record holder for longest freestyle (at nine hours, 18 minutes and 22 seconds). Chiddy Bang crossed the velvet rope quickly with incredible productions from Noah Beresin. Only two years ago they were performing as openers at Drexel’s Spring Jam; now Chiddy Bang has moved on to the big stage performing for hundreds at major music festivals such as Bamboozle. 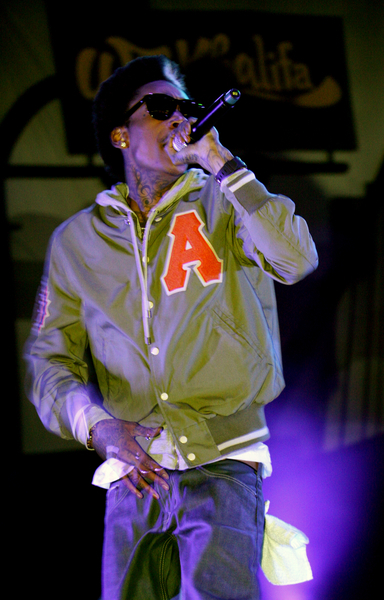 Bamboozle 2011 kicked off with headliners such as Wiz Khalifa and The Taylor Group Saturday, April 30. Upon arrival for the first day of Bamboozle at the Meadowlands Sport Complex in East Rutherford, N.J., the large festival was quite overwhelming, populated by massive amounts of people. Similar to a New Jersey shopping mall, the festival was sprawled with young adolescence and teens that were looking for their stage of choice. Personally, a feeling of displacement and confusion overcame me: “Where do I go?” “Who do I see?” For the first time I felt “over-aged” at a musical event, and the fact that a rush of nostalgia hit me when I heard Boyz II Men reunited at the Bamboozle Prom stage did not help either. Festivals work well for reunions, and Bamboozle featured several, including the highly anticipated sets of The Movielife and Gatsbys American Dream. Long Island natives The Movielife broke up in 2003 after tensions arose for several reasons. Lead vocalist Vinnie Caruana made attempts in the past to reunite the band, but it wasn’t until this year that everyone agreed to perform together again. A huge crowd gathered at Zumiez Stage for the Movielife’s first set in about eight years and the excitement of diehard fans was apparent. For some, this was a band they grew up with and seeing them live is an event they thought would never happen again. As expected, the set was full of emotion as long time fans belted out the words to much-loved songs. The band has not given a definite answer as to whether they’ll play more shows, but they did mention a positive reception could influence their decision. While the Movielife’s reunion is something the band insisted would never happen, Gatsbys American Dream’s return was never out of the question. In fact, they never officially broke up. However, their “hiatus” left a lot of uncertainty – while they played a couple shows in their hometown of Seattle, fans did not keep much faith in the band’s future. Yet Gatsbys surprised everyone when they released a new song online and announced they would play their first show on the East Coast in five years. Their Bamboozle set was in one of the late time slots on Saturday but a large crowd still came out to dance and sing along to the band’s songs. The band plans to release an EP, which fans hope will lead to more music and performances from the group. As I continued to travel through the festival, confused by the vast number of stages and different sounds shooting at me from every angle, the mass of people seemed to navigate easily and effortlessly. This year’s Bamboozle setup and performances can easily be compared to a wine or taste-testing festival. The stages represented vendors; the artists’ music were the products and the customers were the audiences of mostly teenaged people who started out with genres they were familiar with and then wandered from place to place to taste samples of different products from around the country. Between partying with LMFAO, moshing with 30 Seconds to Mars and grooving with Whiz Khalifa, there was something there for everybody at the Bamboozle festival. From hipsters to punks to hip-hop heads, there was room for anybody to enjoy themselves and find their way at Bamboozle. With 10 stages placed just far enough away from each other, having a variety of so many different genres playing at the same time worked surprisingly well. The Bamboozle festival is evidence that the young music fans of today can no longer be divided rigidly by styles and tastes, creating a more cohesive and colorful community of music enthusiasts.